For those expats who have followed all the news about UNAIDS, I was the first woman to win a sexual harassment case against them before the Tribunal. It was an 8 year battle that left me emotionally and psychologically bruised. I put my money into an Old Mutual fund for my future. 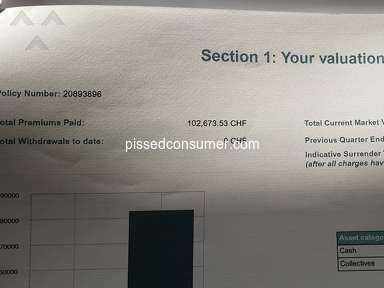 My Chf 102, 673 of premiums paid is now worth Chf 86, 201 - having lost Chf 6'000 in the last 6 months alone. It will cost me Chf 1'000 more to surrender my policy and salvage what I can. I feel as though I have been violated again. To suffer once was bad, to suffer again and lose so much money has brought me to tears every day since receiving my December valuation statement. And has my financial planner contacted me? Absolutely not! I would have been better off placing my money in a bank account with 0% interest. Reason of review: Loss of money. Review #1453297 is a subjective opinion of RomanticMayfly233.